Continuing the series with topics that have a connection to the quintessential Cotswolds house, Daylesford, here is Villa Favorita, the Lugano, Switzerland, residence of Baron Hans Heinrich Thyssen-Bornemisza, a one-time owner of Daylesford. (The Renzo Mongiardino décor for the baron at Daylesford may be seen here). A view of Villa Favorita from Lake Lugano. In 1985,the baron married his fifth wife, Carmen Cervera, a former "Miss Spain" who had been married to Lex Barker of "Tarzan" films, at Daylesford. 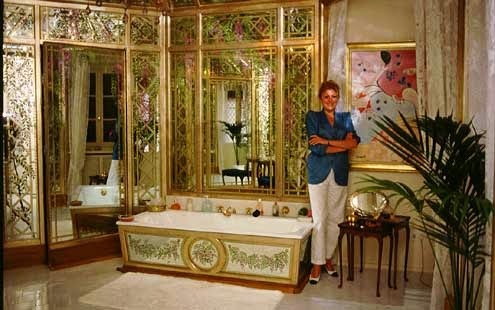 At the time of the photography by Derry Moore that appeared in the July, 1988, issue of Architectural Digest the villa was a residence for both, and one of several. But it was around this time that Daylesford was sold to Carole and Anthony Bamford (see here) as the Cotswolds did not appeal to the Baroness. Bonnard's "Portrait de Misia Godebska," 1908, and Toulouse-Lautrec's "Gaston Bonnefoy," 1891, are among the works of art in the pine paneled English Room, one of a series of reception rooms installed by the baron's father. Photo by Derry Moore for AD. "Mademoiselle Duthe" by Fragonard, circa, 1771, hung between the windows of the English Room while a 1730 Meissan monkey by Kirchner joined Ming and Kangxi piece decorating the marble chimneypiece. The French Room at Villa Favorita. 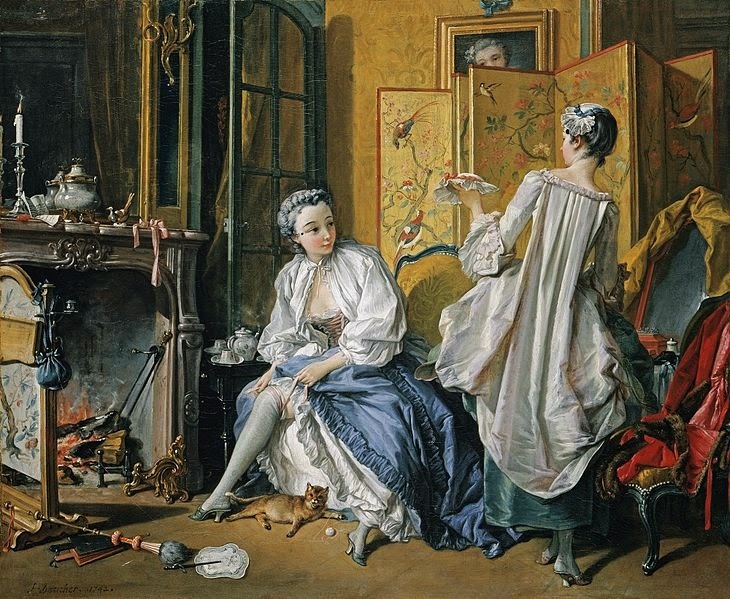 "La Toillette" by Boucher, 1742. Now at the Museo Thyssen-Bornemisza, Madrid. "La Toilette" by Boucher, 1742, hung in the French Room near a Riesener commode with a Clodion figure group. 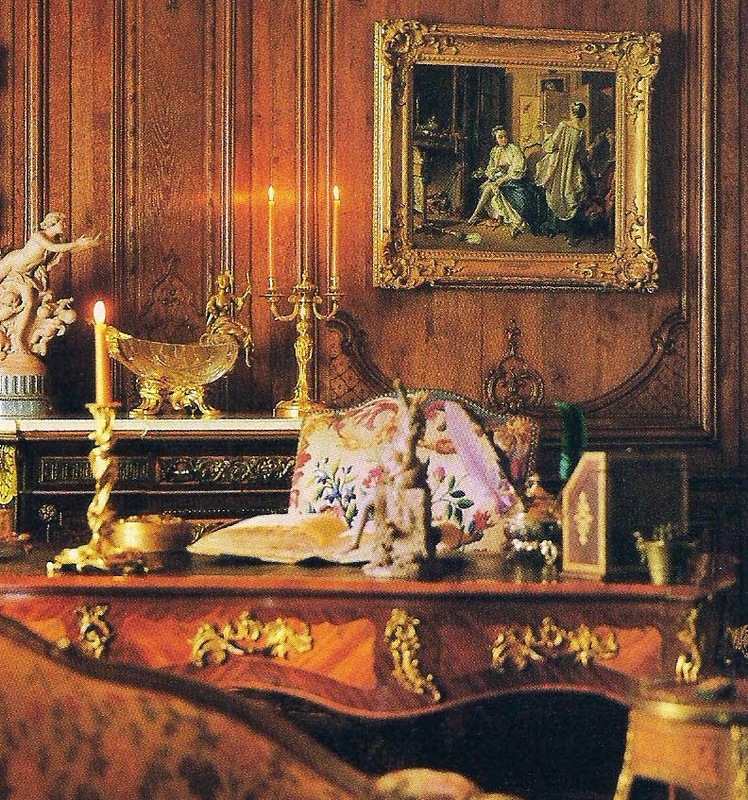 An eighteenth-century bureau plat may be seen in the mid-point of the image from the 1988 article. The Bar at Villa Favorita. A small medieval style room used as a bar is located adjacent to the English Room. Decorated with 19th century paintings in the form of heraldic wall hangings below a painted frieze of open colonnades with stylized urns of flowers, simple chairs and a 16th-century Italian octagonal table contrast with the curves of the walnut tall-case clock from Amsterdam, circa 1720. 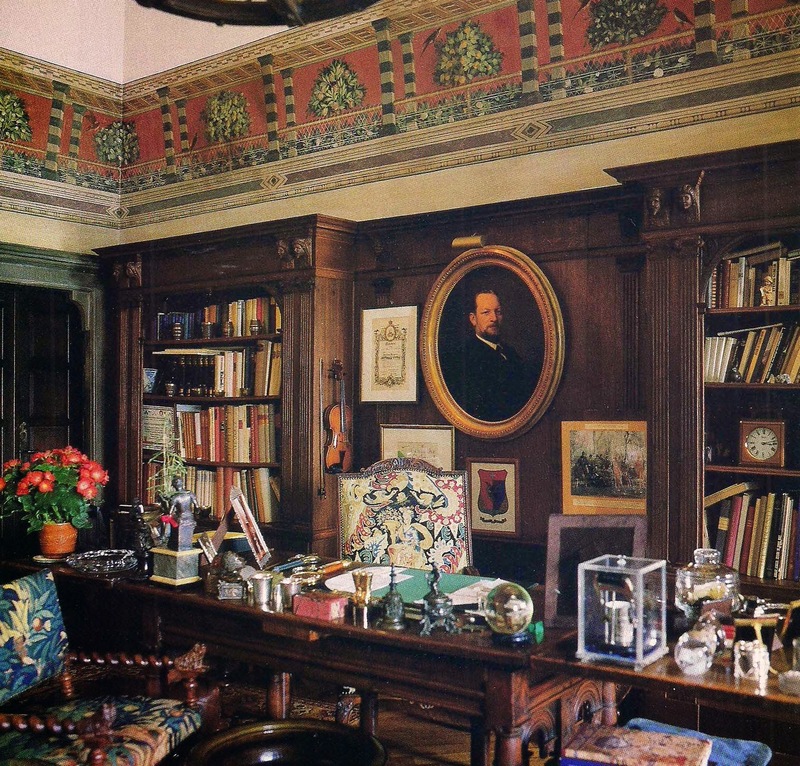 The baron's Study at Villa Favorita. When he was in residence at the villa, Baron Thyssen-Bornemisza spent most of his time in his Study looking over the constant stream of in-coming transparencies and catalogues from art galleries and dealers showing works for sale. The portrait is of the baron's grandfather August Thyssen; although not a collector, he commissioned a number of sculptures from his friend Auguste Rodin. 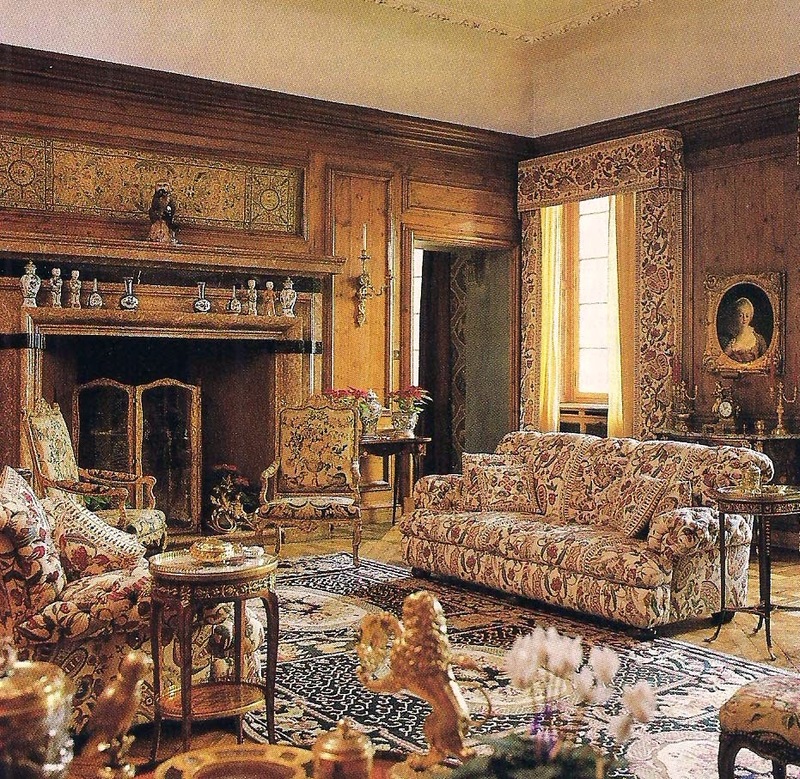 Tapestry covered chairs flank a 16th-century French walnut table used as a desk. 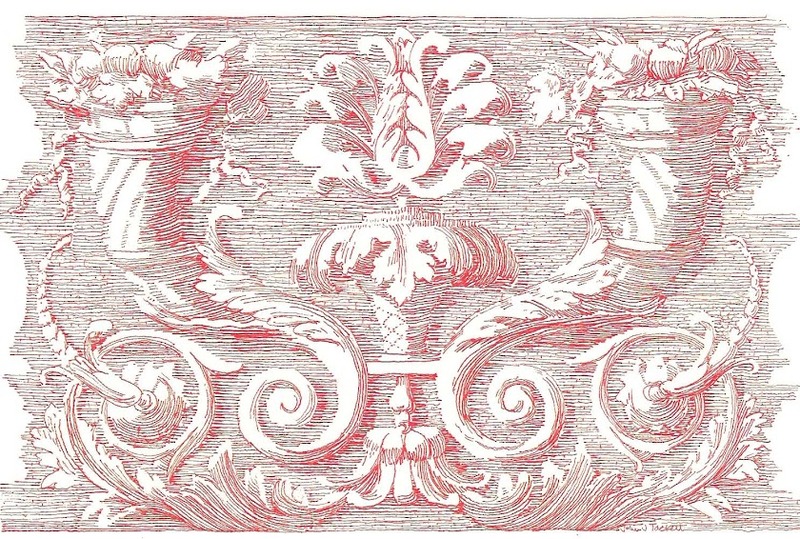 An eighteenth-century Pompeian style frieze provides a colorful perimeter above the dark paneling. 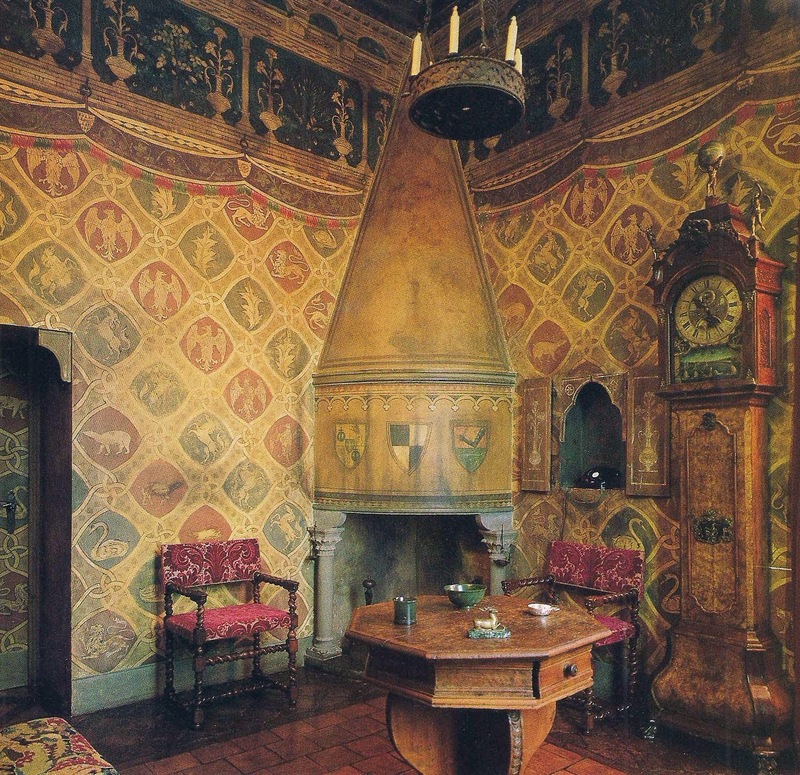 The Gothic Room at Villa Favorita. Linen-fold oak paneling and carved limestone trim decorate the Gothic Room. "The Annunciation" by Jan de Beer, 16th-century, was paired with Andrea Riccio's terra-cotta "Madonna and Child," circa 1520. The painting is now at the Museo Thyssen-Bornemisza, Madrid. Details of the Master Bedroom at Villa Favorita. 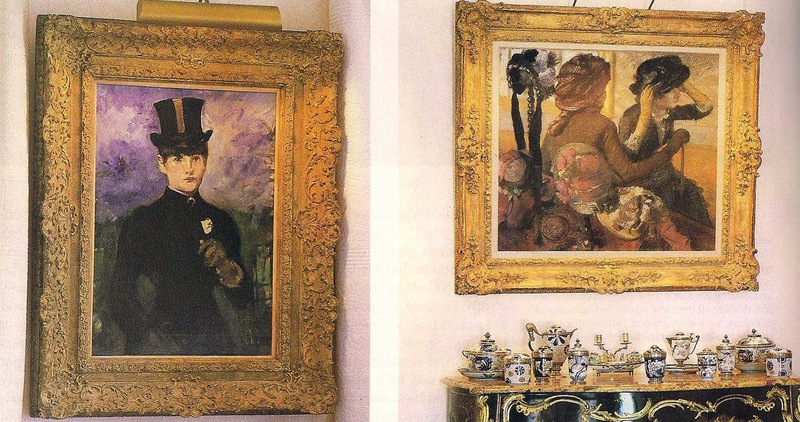 In the Master Bedroom, Manet's "L'Amazone de Face," 1882, and Degas' "Chez la Modiste," 1883 were displayed. Both "Horsewoman, Full Face" and "At the Milliner's" are now at the Museo Thyssen-Bornemisza. The baron's Dressing Room at Villa Favorita. 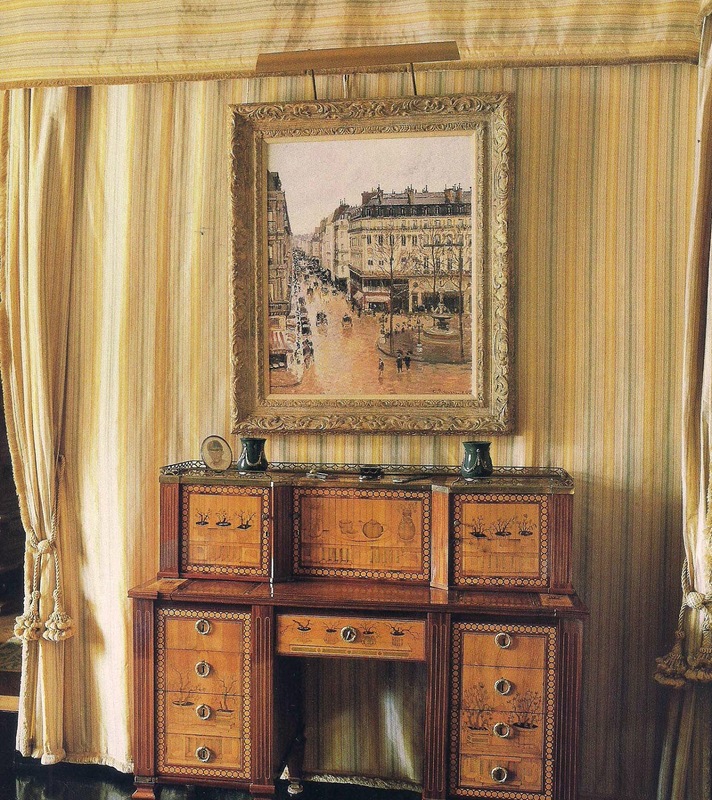 Striped silk wall hangings in the baron's Dressing Room provided a backdrop for Pissarro's "Rue Saint-Honore, Effet de Pluie: Apres-Midi," 1897, and a Louix XVI bureau a Gradin. poses by her bathtub at Villa Favorita. 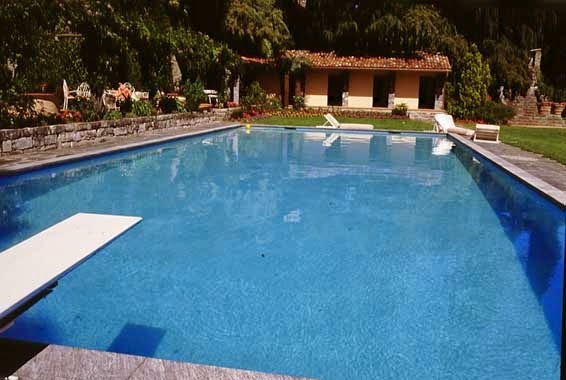 The swimming pool at Villa Favorita. 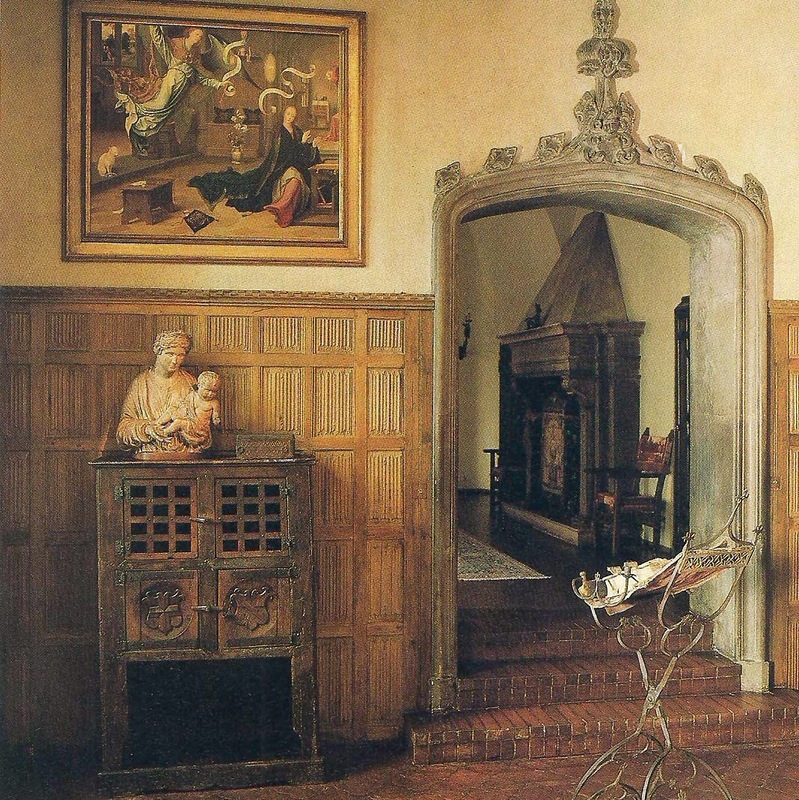 In the article by Peter Lauritzen, the baron is quoted, "My father [Henrich] acquired the seventeenth-century Villa Favorita from Prince Friedrich Leopold of Prussia in 1932, and brought [his collection of] the old-master paintings there. He had first shown them publicly in Munich only two years before." 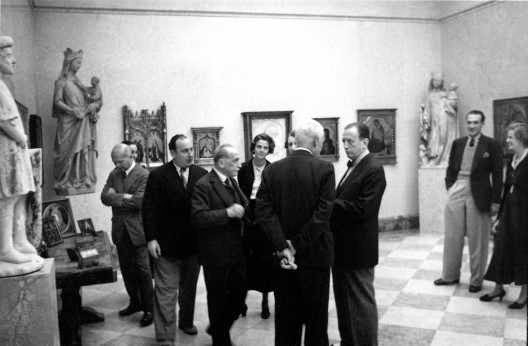 in the Gallery at Villa Favorita, 1947. Until his father's death in 1947, the collection was seldom seen by the general public although his father had added a large gallery to Villa Favorita to display the art. The baron added to the collection, at one time second only to that of the Queen of England. with Picasso's 1923 "Harlequin with a Mirror"
now at the Museo Thyssen-Borenmisza, Madrid. Starting in 1960, select paintings from the collection were loaned out or travelled in special exhibitions of the Thyssen-Bornemisza Collection. In addition, the villa's gallery was open to the public on weekends seven months of the year, and more often when special exhibitions were held at Villa Favorita. proposed by British architect Robert Stirling. Image via Ticino Tessin, The Swiss Castles blog. When the design for expansion by British architect Robert Stirling of the firm Stirling & Wilford failed to meet acceptance from local officials, offers from outside the country were considered to provide a home for the stars of the collection so that they could be viewed by larger numbers. Despite persuasive talks with the Getty Museum in California, and a personal visit by Prince Charles on behalf of British museums, the government of Spain won with the offer of the Villahermosa Palace, to be refurbished to the specifications of the Baroness, opposite the Prado in Madrid. That is now the location of the Museo Thyssen-Bornemisza, filled mostly with art taken from Villa Favorita, opening in 1992. A distant view from the lake showing the context. extent of the shorefront property of Villa Favorita. 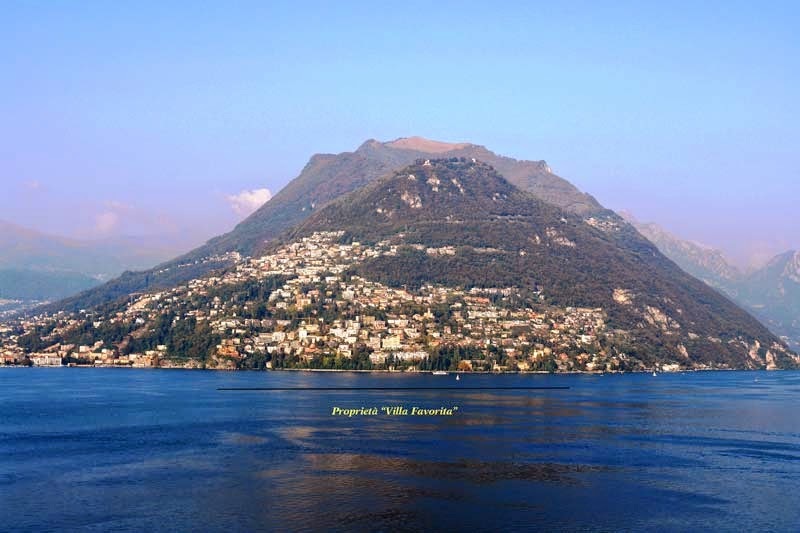 Image via Ticino Tessin., The Swiss Castles blog. The remaining collection at Villa Favorita was reorganized and the gallery was again opened to the public for some years before closing. Baron Hans Heinrich Thyssen-Bornemisza died in 2002. Carmen "Tita" Cervera, as the dowager baroness is now usually referred in the press, opened the Carmen Thyssen Museum in Malaga in 2011. Her museum contains art from her collection on a long term free loan, with many of the paintings previously displayed at the Thyssen-Bornemisza Museum during the previous 12 years. That same year of the museum opening in Malaga, she decided to sell "The Lock" by John Constable from her private collection to raise funds; in 2012 it sold for an artist record GBP 22.4 million. In 2013, Carmen Cervera came into the international spotlight again when it was discovered that she was using a complex offshore structure as a tax haven; her spokesman said it was only used to move art from country to country. Carmen Cervera still holds a Swiss passport according to press reports. 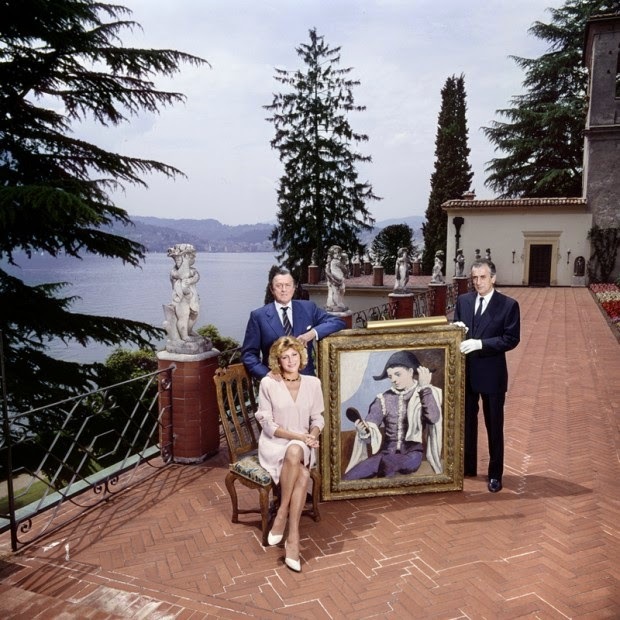 As Switzerland does not tax art, it is believed that the villa still holds a significant collection, the primary source of her wealth. This series of posts of The Devoted Classicist with a connection to Daylesford continues with the next essay. Longtime wish to have seen...what will become of it when she is gone? The Boucher seems to be the companion to the Boucher at Frick, Madame Boucher. What is your take on all ending in Spain? I put the blame on the dame, or rather the baroness, for the dispersal from Villa Favorita. T.S., this is only my opinion, and certainly I do not have all the information, but I think the Fifth Wife status had something to do with Carmen Cervera wanting control, and perhaps status, by arranging for the stars of the collection to end up in Spain. Very few art institutions display their entire collection at once, and I do not see why the Thyssen-Bornemisza collection could not still go on touring and having special exhibitions at Villa Favorita. But such is the fate of a private collection, one of the times that a Board of Directors might have had a more far-sighted vision than a single owner. Thank you for commenting. The so-called English room looks entirely continental rather than English but a magnificent room, nonetheless. "La Toillette" by Boucher is one of my all-time favourite pictures. It might seem obtuse to refer to cabriole legs in this context but they are lovely. B., I agree about the room names, but that apparently was as the baron referred to them; everything is relative, after all. In the painting, I think no aspect was left unconsidered and that is one of the things that makes me love it so, all the details and how they are shown. Thank you for your comments. It is fascinating....how a collection ends up! Fascinating! Thank you for your wonderful information! P., I have never been to Madrid, but would love to go. Thanks for commenting. The picture of the baron and baroness with their Picasso seems slightly bizarre, as though they are showing off their acquisition in a very ostentatious manner; I wonder what the story is behind that. C., I don't know the circumstances around the occasion of the photo. If I am not mistaken, the baron acquired the painting in 1979, so that's not it. Since the picture light is attached to the frame, it almost looks like it was taken off the wall and brought outside for the photo. Maybe another Devoted Reader will know. Thanks for commenting. Thank you for this post, which brings back many pleasant memories! As you know, I have lived in Switzerland since 1988. 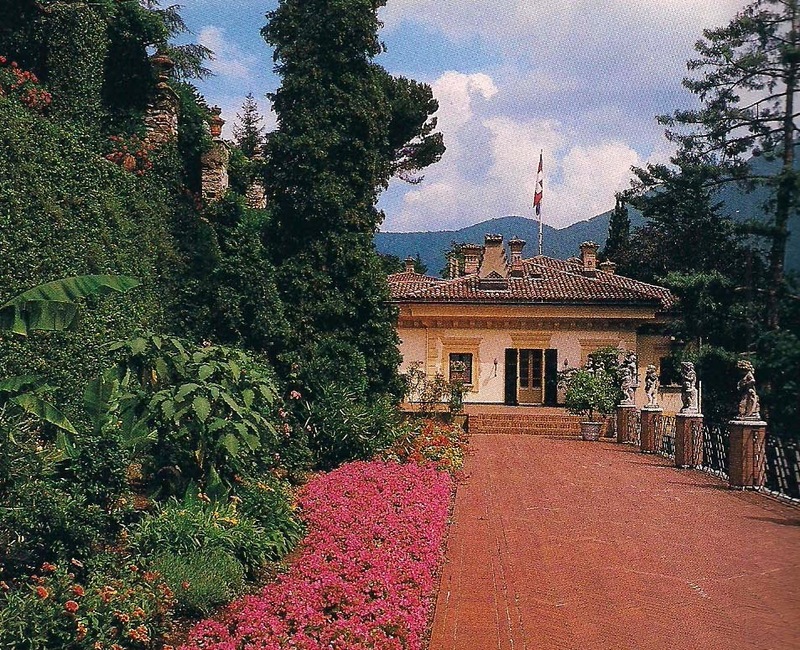 In my early years here I visited the Villa Favorita on several occasions. It was indeed a magical place, and the art collection utterly ravishing. The beautiful setting definitely enhanced it even further. I see you have presented the official version of why the collection was removed from Lugano. However, I don't really think it is accurate. 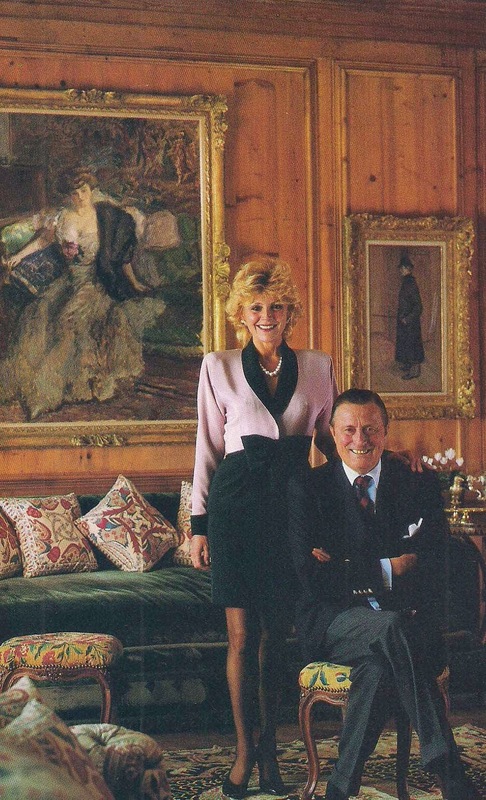 In fact, the real reason why the collection went to Spain, it is said, was because Baron Thyssen, an immensely rich man who will certainly have enjoyed great tax privileges in Switzerland, expected the Swiss state to help finance the extension to his villa. The Swiss government rightly refused (nothing to do with planning permission), and so as the Baroness was Spanish, the paintings went to Madrid. It is really a loss for Switzerland, but I can entirely understand why the Swiss were not prepared to give such a privileged man even more money! T.A.G., thank you for additional insight into these issues. Although I proof-read the essay a couple of times before publishing, I often have a mis-step or typographical error (especially in the captions which are not written out as a draft as the other text, so I should be especially careful); I have returned the dowager baroness to her rightly title. Your contributions are appreciated.